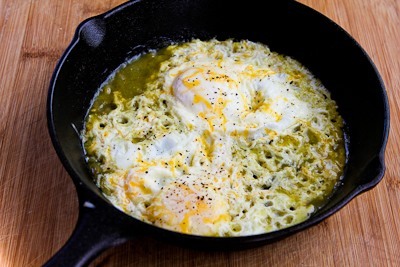 These Fifteen Minute Salsa Verde Eggs were a breakfast experiment that’s a definite keeper. Eat with low-carb tortillas, or if you skip the tortillas, this meatless breakfast idea can be low-carb and South Beach Diet Phase One. Use the Diet-Type Index to find more recipes like this one. Click here to PIN Fifteen Minute Salsa Verde Eggs! 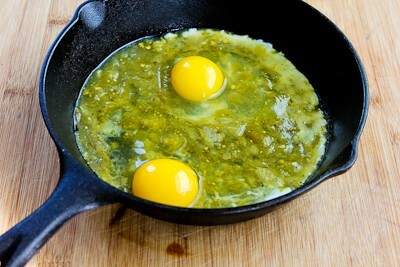 Fifteen Minute Salsa Verde Eggs! The idea of eggs cooked in some kind of spicy sauce is what has inspired famous dishes like Shakshuka and Huevos Rancheros. I could have been thinking something like that when this simple breakfast idea for Fifteen Minute Salsa Verde Eggs popped into my mind, but truthfully I think the recipe was most inspired by a jar of salsa verde that I stumbled across in the pantry. This was one of those “What can I make with ingredients I already have?” kind of experiments, and wow, did I love this easy breakfast. I ate my Salsa Verde Eggs with some of my favorite low-carb tortillas to dip into the egg yolk, and savored every bite. These eggs were quick and easy for a delicious low-carb breakfast idea that’s perfect for a morning when you need breakfast and don’t have much time. And this is also one of my easy Five Ingredients recipes, or only four ingredients if you skip the low-carb flour tortillas! If you’re a regular reader you’ve probably noticed that I’m updating lots of my favorite recipes in the ongoing effort to correct all the formatting errors that showed up when I switched Kalyn’s Kitchen to WordPress! No regrets about making the switch, but oh my, so many formatting errors. I am slowly correcting them and switching to the improved recipe format that has a printer-friendly button right in the recipe. And it gives me a chance to show off the recipes I’ve really loved once they are all spiffy with the new format; hope you enjoy trying this one! 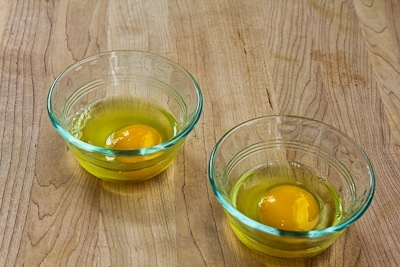 There are two reasons for putting the eggs into little dishes before you start heating the sauce. Not only does it help them come to room temperature (so the whites cook quickly and keep the yolks runny) but it also helps you get them into the frying pan without breaking the yolks. I made a single serving in an 8 inch frying pan; just double the recipe to make Salsa Verde Eggs for Two in a larger pan. Start by putting 1/2 cup of your favorite Salsa Verde into a frying pan that you’ve sprayed with olive oil or nonstick spray. Cook the salsa verde over medium heat for 4-5 minutes, or until it’s bubbling. (Getting the eggs piping hot like this is important so the whites cook quickly and leave the yolks soft. Then gently nestle the eggs on top of the spicy sauce. The white should almost immediately start to cook if your salsa verde is nice and hot. Sprinkle a couple of tablespoons of grated cheese over the eggs, cover, and cook on medium-low for about 3-4 minutes, or until the whites are firm and yolks are still soft. (Or cook them to your liking if you’re not into soft yolks. Season eggs with salt and fresh ground black pepper and serve hot. 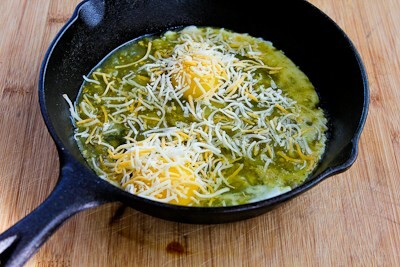 Fifteen Minute Salsa Verde Eggs are delicious with low-carb tortillas to dip into the yolk if desired. These Fifteen Minute Salsa Verde Eggs were quick and easy for a delicious low-carb breakfast idea. Spray an 8″ frying pan with olive oil or non-stick spray. Add 1/2 cup of salsa verde and cook over medium heat for 4-5 minutes, or until the salsa is piping hot and starting to bubble. While the eggs are cooking, heat or microwave the tortillas if you’re using them. When eggs are done, season with salt and fresh ground black pepper and serve hot, with tortillas if desired. This recipe created by Kalyn when she had a jar of salsa verde that needed to be used. I chose the South Beach Diet to manage my weight partly so I wouldn’t have to count calories, carbs, points, or fat grams, but if you want nutritional information for a recipe, I recommend entering the recipe into this nutrition analyzer, which will calculate it for you. Or if you’re a member of Yummly, you can use the Yum button on my site to save the recipe and see the nutritional information there. Thanks for this. I had some Herdez Salsa Verde in the fridge. left over from some green enchiladas. I’ve made Shakshuka, but this is a step up. I made these this morning, and served the eggs on top of…crumpets! Weird, I know, but I had them, and the whole thing was good. I’m just so happy that you share all the ways to eat. Thanks Joyce; so glad you enjoyed it! Kalyn, what kind of salsa verde did you use? I’ve been have disappointing experiences with the ones of tried. I love the green salsa from Trader Joe’s, but I don’t live close to there so I usually use this one. Hope that helps! It looks delicious! I love the idea! I would add more cheese! Glad you like it. And I am always okay with more cheese! This was on the breakfast menu today — oh my deliciousness. If you enjoy salsa verde you must try this ASAP. It will not disappoint. Thanks Laurel! So glad you enjoyed it! I have made this two Sundays in a row – I love a delicious and easy Sunday brunch. Maybe after a few more tries I'll stop overcooking the eggs, but it's still great. 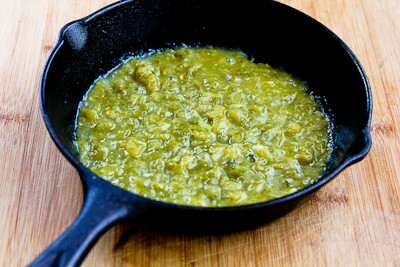 Today I mixed a Herdez salsa verde with Trader Joe's Hatch Chile salsa. It was a perfect combination. So glad you are enjoying it. I love both those salsas. Thanks Bill, glad you like it! This is very similar to a traditional Mexican dish called chilaquiles in which toasted chips or tortilla slices are simmered quickly with the salsa (rojo, verde, or mole) then tossed with fresh vegs (onions, avocado, cilantro, whatever) and topped with a savory ingredient (pulled chicken or pork, fried or scrambled eggs, queso fresco, etc.). We used to eat this on the ranch with yesterdays stale tortillas, eggs fresh from the coop and tomatilla salsa before making the fresh tortillas for the day. I just finished this most tasty breakfast. Really delicious. I skipped the tortillas, but did not miss them at all. I'm just coming down with a cold and I find myself craving spicy things–odd…Anyway, these hit the spot. Thanks. That's so funny, I've made this too. We think alike Kalyn! I just went to Costco and found this great salsa. Its a molcajete fire roasted type. I used that instead of the verde. This was so delicious! I omitted the tortilla and added some avocado slices! Yum! I have a weird love hate relationship with eggs. I know they are so good for me and low in calories, high in protein, but I get grossed out by them so easily. Cooking them in the salsa is brilliant! I can totally eat eggs this way! Barb, just added that salsa to my Costco list! Salsa from Rojo in the refrigerated section. It's a large 42 oz. contained but its soooo good you won't have a problem using it up. ? Eileen and Kevin, thanks. And the runny yolks is always a plus for me! Monika, can't imagine moving that many times, but thanks for doing it. As a military wife with 14 moves behind us, we called meals like this "pantry surprise"! Always happy when great new recipes came of the experiment. So easy and yet so so good! This is my kind of breakfast! These eggs sounds great! It helps that salsa verde is my absolute favorite, of course. 🙂 If I'm having eggs with salsa, I usually just scramble them all together–gently poaching the eggs in the salsa is such a good plan. Plus: runny yolk! Lydia, I like that idea! Great way to clean out that pantry! I love breakfasts like this, quick and easy. I might add a touch of green Tabasco to mine! Merrill, I think that would work. The enchilada sauce is thinner, so I might use a couple tablespoons more and simmer it a few minutes longer so it's reduced a bit. 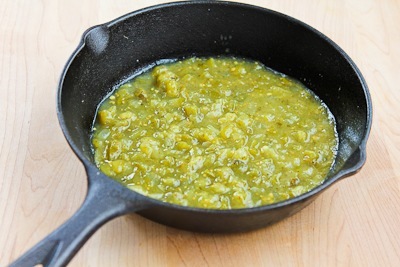 I don't have any salsa verde on hand but do have green enchilada sauce – close enough? Joanne, Val, and Debby, so glad you like it. For such a quick breakfast, I really enjoyed this. This is SUCH a delicious idea! I've been eating eggs nonstop lately so these are definitely going to be made soon! Yum!